Lately I've had a serious case of Bathroom Envy. Not one particular bathroom, but I keep finding myself staring wistfully at images of beautiful bathrooms here there and everywhere. 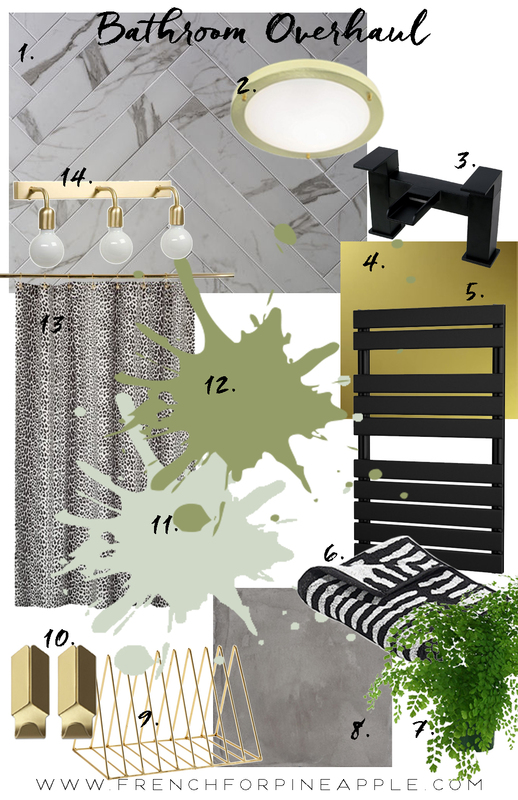 Our bathroom is looking super unloved, so I've started plotting an overhaul. This has been brewing for well over a year, maybe two or three, but somehow, someway, I'd like to make 2016 the year of the bathroom overhaul. It's time. As with the kitchen, I was making do with what we'd inherited when we moved in nearly eight years ago, without spending a load, so we did a few things just after we moved in - mainly essentials like adding a proper shower over the bath in what was the only bathroom in the house because there wasn't one, (unless you call a hose attachment from the bath taps a shower - I don't). We also changed the sink to a decent sized one from the cloak room sized tiny little thing that was there. There was also no ceiling light - the previous owner had a wall light which was ripped out before she left as it wasn't a compliant bathroom fitting, leaving live wires hanging out of the wall (even less compliant! ), so we had those sorted out, covering the holes with spare tiles found in the cellar, and added a ceiling light, which was a rush cheap job from the closest hardware store. The plastic fitting had since disintegrated so I've recently had it replaced with the fitting on my moodboard below. A tiny step in the right direction. The bath panel got damaged when it had to come off to add the shower plumbing, so I tiled a new one in mirrored mosaics, and despite best intentions, never finished grouting it. Yep, left unfinished for probably seven years. Then there's the sparkly grey vinyl floor tiles which I never finished sticking down. Oh the shame! I hate having to admit these things, and I've only recently realised (or perhaps admitted to myself), that an abandoned DIY job is usually a sign that I'm not happy with what I've chosen, or how it's turning out. 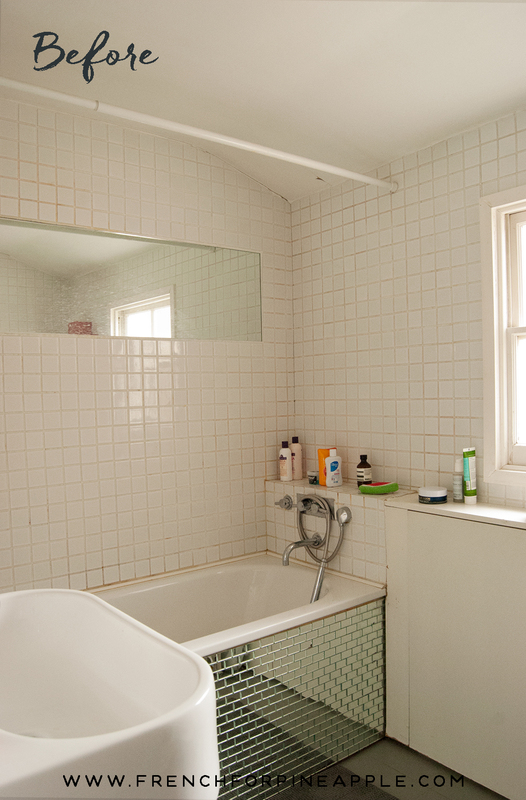 The bathroom is a prime example. But my taste has changed quite a bit over the last eight years, and now I want less disco sparkle, and more classic with a glam contemporary edge. The shallow melamine cupboards which also house the toilet cistern, are yellowed with age and water damaged, the paint is peeling on the window frame, there are cracks in the plaster on the ceiling, the grouting is stained and looks filthy (I promise, it's as clean as possible! 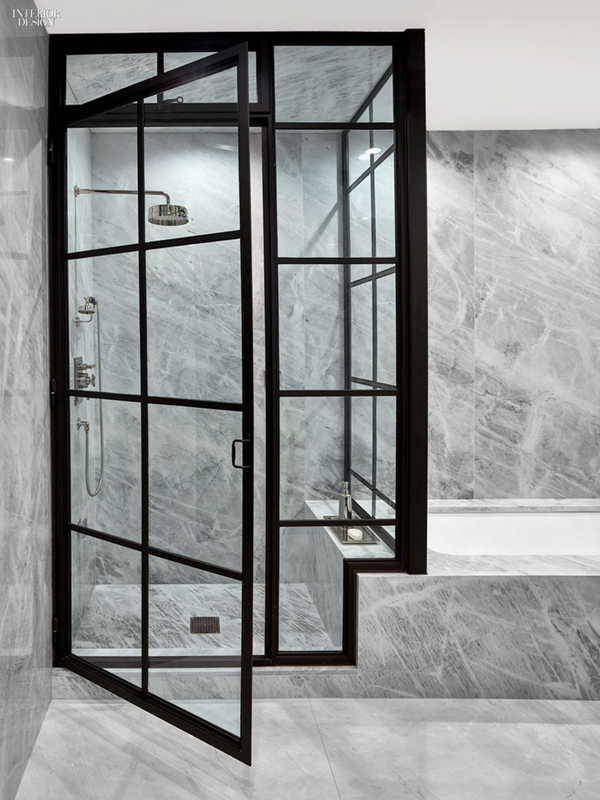 ), the mirrors get water on them from the shower so are constantly building up with limescale, all adding to the tired and grotty look of the room. 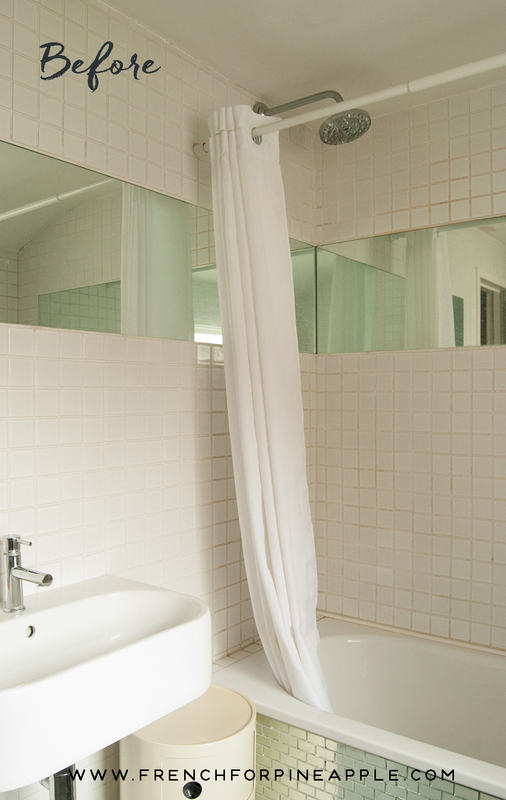 The wrap around mirror set into the tiles on two walls is too high, and I can't actually see my whole face in the mirror unless I stand on my toes, or wear heels, which I'm not in the habit of doing in the bathroom on a regular basis. I'm about 5'4", so not unusually short, but no, I can't see my face in my own bathroom mirror. This is a constant source of amusement for my husband, and a constant source of annoyance for me. If that's not justification alone to rip it out, I don't know what is! In lieu of funds to get someone to come in and do it all for us, this will be a slooooow burning DIY job. Depending on what tiles we choose, we may get someone in to lay them for us (I know, shock horror! ), along with a plumber to do any plumbing work that ends up needing to be done. I'll get my carpenter to replace the melamine cupboard doors that will be painted, which probably isn't ideal given the proximity to the bath and therefore water, but this is a budget job and we'll just have to be mindful. Everything that we can do ourselves, we will. Do you know what I hate even more than having to admit to DIY and design failures? Showing ugly before pictures on my blog. But here goes! Believe it or not, just to reiterate, it's actually clean, just horribly stained grout and well, okay, the mirrors do clean up better than this with a load of effort, but I'm so over this room, I've kind of given up. My plan is to slowly start removing the tiles in the in areas furthest away from water, and we'll see what kind of mess condition the walls are in. I expect they'll need to be skimmed, as I don't plan on tiling floor to ceiling again, so I'll have to get someone in to do that once all the tiles are off. Unfortunately, plastering is not a skill either my husband or I possess. We'll most likely stick with the existing sanitary ware - we'll obviously keep costs down if we don't need to purchase these things or get a plumber in. That said, the radiator needs to be changed so a plumber will be needed at some point, and it will need to come off to remove the tiles and fix the plaster anyway. Hmmmm, this job is getting bigger as I write and we haven't even started! I'd love to replace the taps and shower fitting with either gold or black (I'm actually leaning towards black), but we'll have to see if that's possible budget wise as we progress. I'm sure the kids won't mind living on baked beans this year, will they? I know I can make it look a whole lot better than it currently does without us having to remortgage (we'll save that for the kitchen extension one day!). So, let's talk about the fun stuff! 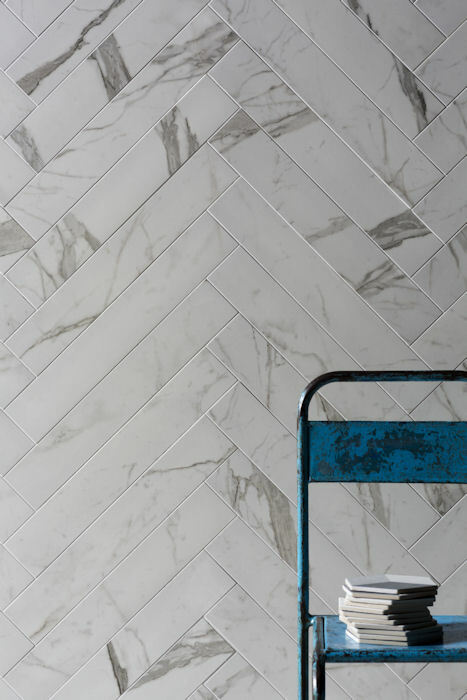 I'd love to use these beautiful tiles from Mandarin Stone laid in this herringbone pattern in the area around the bath/shower and perhaps on the bath panel too. They're actually the thing that's inspired me to start seriously thinking about this revamp. 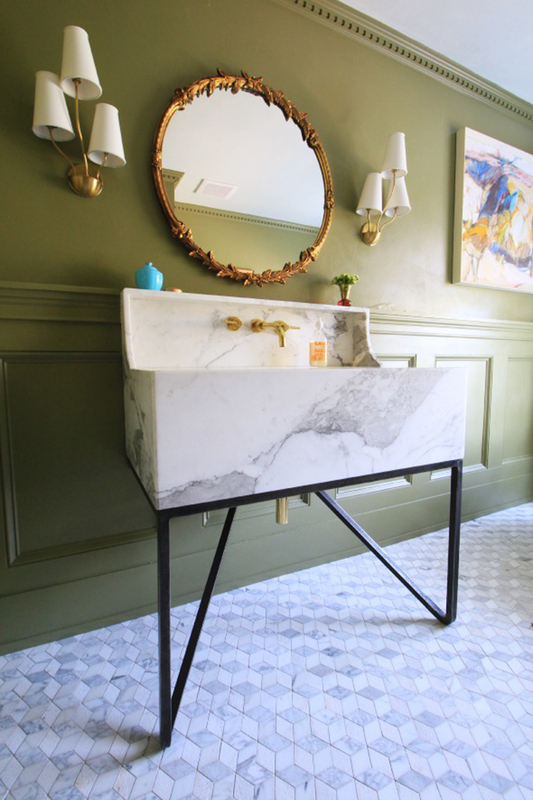 They look like marble, but they're actually porcelain, so they're cheaper than marble and low maintenance. I love the relatively high contrast of the veining against the background, with lots of movement. Just gorgeous. 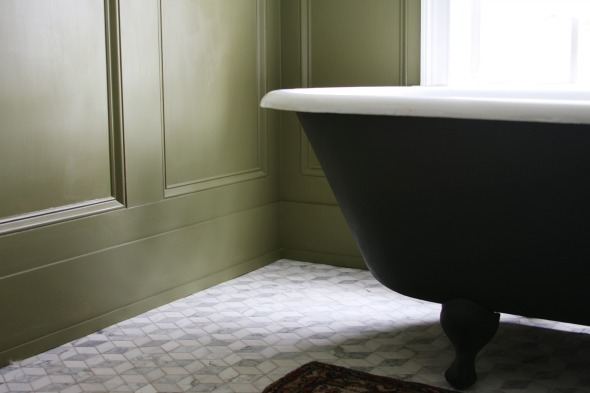 I'd also like to add some decorative moulding to the cupboard doors and paint them - possibly Olive by Farrow and Ball, inspired by Jenny Komenda's beautiful guest bathroom. Or perhaps emerald green, or am I going to go blue?! Clearly I haven't decided on that one yet. Another option would be to add tinted mirror or sheet brass to the doors, but that would be substantially more expensive. Besides, I've been wanting to add some moulding to the house somewhere forever and this is a nice way to introduce it in a small area. The top of the cupboards is a shallow shelf which runs along the entire wall and is also currently aged/yellowed/stained laminate. I would love to have a piece of marble cut for this, however it will depend on tile choices. The other possibility is to use a piece of gold tinted mirror which would certainly be much cheaper. As for the flooring, I'd like to put tiles in to replace the vinyl, but I need to look into the cost of underfloor heating before that decision is made because I hate cold floors underfoot. I love this Georgica Pond Marble from Fired Earth. I love it a LOT. 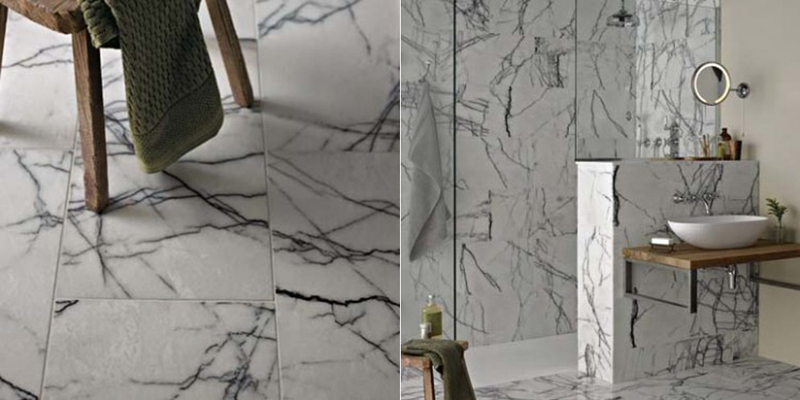 But I obviously wouldn't use it with the Mimica Statuario tiles, if we used these I'd use a plain wall tile, because this is such a showstopper. Extreme marble as I like to call it. And just WOW, to the floor and shower enclosure being done, but that's most definitely not in the budget. Sob. Versions 1.1, 1.2 and 1.3 may materialise before we even pull a single tile off the wall, but I really like this direction. As far as colours go for the cupboard doors and walls, as I said, I'm undecided, but I'm loving each of these possible combinations . I expect paint colour decisions will be left until the tiling is done, and will result in several (more) tester post purchases. DON'T TELL MY HUSBAND! There will be changes and compromises along the way, but whatever we end up doing it's going to be a gazillion times better than what we've currently got. And I for one, CAN. NOT. WAIT. I'm such a bad blogger! But hey, belated replies are better than none at all. I think? I love an over the top tile. By the time we do the bathroom, I'll have settled on each colour ten times and changed my mind fifty. At least. You know, I'm now rather loving Farrow & Ball's new Salon Drab as a possible cupboard colour. Brown is BACK baby!